I am excited to be participating in the blog tour for Love at First Slight hosted by Jakki of Leatherbound Reviews. Since I had J Marie Croft as my guest on October 8, 2013, I am sharing my review of her book now. This is my second time to be part of an actual author blog tour and I thank you, Jakki, for inviting me. When I first heard of this story with all the character genders swapped, I had many questions immediately come to mind. How could certain plots play out when female actions were so limited during Regency times― the proposal, for instance. Never fear, J Marie Croft does a remarkable job of making it work. Not only does she handle all the role reversals with ease and much wit, she follows the original storyline. She gives some quotes to different characters or uses them in a different place and does so seamlessly, never ‘missing a beat’. As for the first proposal, it was flawlessly done! Mr. Benjamin Bennet was hilarious as the fretting father hoping to marry off his five sons to wealthy women. Mrs. Bennet (Flora) enjoyed her books (and booze) and was not the least interested in talk of the Mertyon Assembly and gentlemen’s cravats! One of the things that I loved about this book was the author’s clever word play. At the church service when Casper (Caroline) prayed for Elizabeth (Darcy) to notice his shapely calves and Elizabeth prayed that Casper would spontaneously combust! There are many instances of a description with a string of words all starting with the same letter or having the same suffix. I got much pleasure from discovering them as I read and seeing how easily they were incorporated into the story without disturbing the flow of it. Casper Bingley made an excellent Caroline. I loved William Bennet as Elizabeth and Elizabeth Darcy as Fitzwilliam Darcy. The characters were all done very well and the story worked. 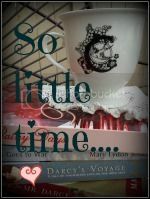 It had wit, misunderstandings, romance and was a lot of fun to read. Good job! The only thing I wished for was a little additional information given to the ending. It came a little quicker than I would have liked. I wanted to know about some of the other characters and what happened to them. I also wanted to know of William’s future plans―would he take the living or run an estate? It is only a small quibble but it left me desiring a bit more. Overall I found this novel delightful. The title is perfect for this ‘topsy-turvy’ tale with genders reversed. It starts the marvelous word play that is to continue. 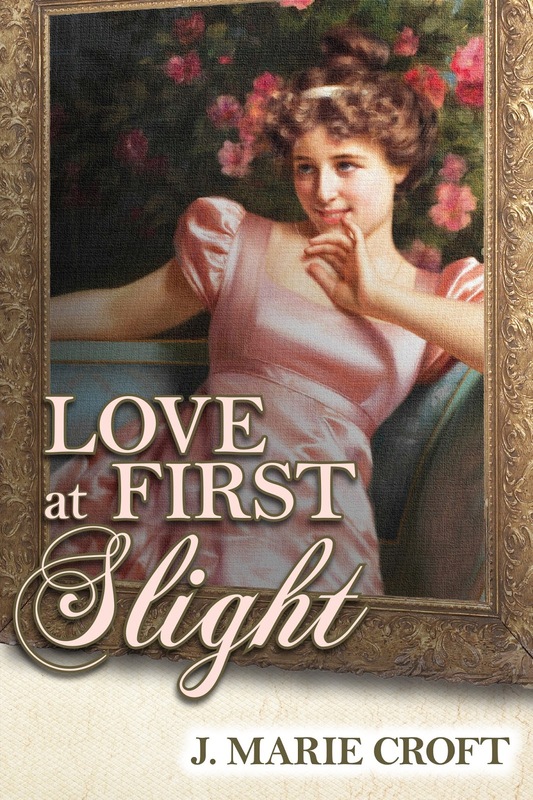 Love at First Slight is lively and entertaining―much fun to read. Thank you, Ms. Croft for this clever re-telling. I highly recommend! 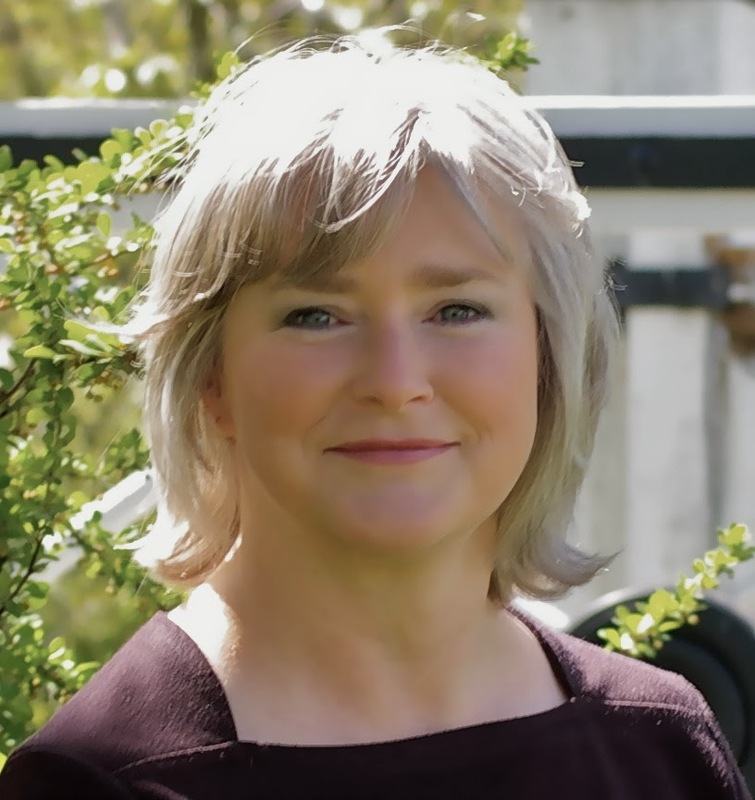 J. Marie Croft lives in Nova Scotia and divides her time among working at a music lesson centre, geocaching (a high-tech treasure hunt) with her husband, and writing. Her stories are lighthearted; and her tag line is Jane Austen’s quote, “Let other pens dwell on guilt and misery.” A member of the Jane Austen Society of North America (Canada), she admits to being excessively attentive to the 1995 BBC version of Pride and Prejudice. Adult twin daughters are the light of her life even though they don’t appreciate Mr. Darcy the way ‘Momzie” does. and Diary of an Eccentric on February 28. I am eager to read this one out of curiosity about the gender reversals, but her clever use of words too. Thanks for sharing, Janet! I'm so glad that you came by, Sophia Rose. I hope you get a chance to read this one soon. I think I had a smile on my face for most of the book and laughed out loud several times. It was very well done. Thank you, Janet, for participating in the blog tour and for your lovely review. Your kind words are much appreciated. When I started writing LaFS, I had many questions too; so I'm glad that, in your opinion, the story worked. That you enjoyed the word play made my day! The original ending had closure for all characters, and I now regret discarding the last chapter and epilogue (as requested by the original publisher). Since curious minds want to know, perhaps I'll dust off that section, polish it up a bit, and post it online somewhere. Thanks again, Janet. Your effusions have put a big smile on my face! If you ever want a place to post that last chapter and epilogue, you have a standing invitation to do so here. I would love to read it. Your word play was awesome. It added extra dimension without diminishing the plot. The first few times I thought might be coincidental but soon I started watching for them. It was such fun! I'm glad that I put a smile on your face. Your book certainly put one on mine! Lovely review, Janet! Joanne is a master at wordplay! I love all the quotes you shared! :) I love her sense of humor, you can't but have a good time reading her prose! Thanks, Meredith! Doesn't Joanne have a wonderful way with the wordplay? It was such fun to read and she does have a marvelous sense of humor.